​​Haulotte offers a network of instructors to provide customers with know-how as well as the skills essential for guaranteeing safety, expertise and effectiveness when maintaining and operating Haulotte equipment. The Haulotte Services training catalogue is entirely adapted to providing customized instruction tailored to each individual need. For that reason, Haulotte Services proposes training cycles and programs personalized according to levels of skills and training objectives (commercial training, training adapted for specific fleets, etc.). Theoretical and practical training sessions are conducted at our North American headquarters in Virginia Beach, Virginia, to ensure professional training and practical understanding of material. 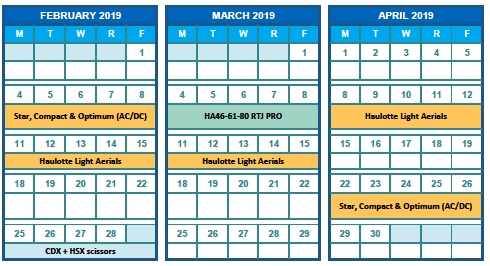 Sign up for training on Haulotte Light Aerials, Optimum & Compact Scissors, Star's (A/C) Full Range and more. See current dates available (shown right). Once you are signed up. Training: Class will start at 8:15am each day, all trainees will meet in the lobby of the hotel at 7:30am each day in order to follow or ride with the trainer over to the training facility. Class will end at 5:00pm each day; the trainees will be dropped off at the hotel and will have free time for them for the night. Travel: The trainees will travel on Monday of the training week. Class will be conducted on Tuesday – Thursday of the week. Lodging: As always, Haulotte will cover the cost of the hotel for each trainee. The reservation will be in their name. Again, your hotel room will be ready on Monday (for an early start on Tuesday). Meals: Hotel provides complimentary breakfast; Haulotte will cover the lunch for each trainee at the training facility. Virginia Beach offers many options for dinner so feel free to explore the area and see the sights each evening. Please feel free to contact us or Randy Walton with Haulotte with any additional questions. Haulotte needs this information to confirm your place in training and to arrange your hotel room. Please provide all of the information below. ​Please let us know the date of the class you would like to attend. If your preferred date is not shown on the calendar, please let us know the approximate time/month(s) you would like to attend. Please let us know the date of the class you would like to attend. If your preferred date is not shown on the calendar, please let us know the approximate time/month(s) you would like to attend. The Haulotte Service Providers are equipped to handle major repairs, complete diagnostics or refurbishing machines.